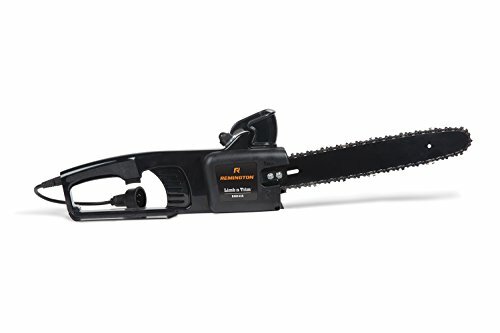 Designed to cut small limbs and saplings, the Remington RM1425 Limb N Trim electric chainsaw provides rugged construction and user-friendly features. The Limb N Trim is equipped with an 8 AMP motor and has a 14-inch low-kickback bar and chain. It comes with a push-button oiler and an external adjustment system for reliable chain tensioning. Unlike gas-powered tools, this electric chainsaw does not require gasoline, and it’s easier to start. Whatever your task, this machine can adapt and help you get the job done. It also comes fully assembled and is backed by a 2-year limited warranty. 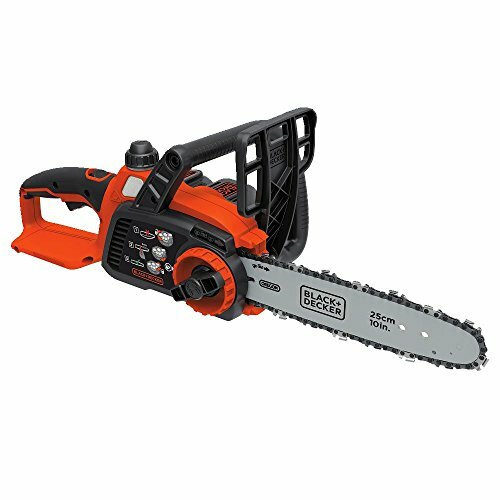 The Black & Decker CS1518 15amp 18" Corded Chainsaw offers a 15 Amp powerful motor for large branches and demanding cuts. This chain saw has an 18" premium bar and chain for improved cutting performance. It offers tool-free chain tensioning for quick and easy chain adjustments, along with an automatic oiling system which ensures constant bar and chain lubrication. It has a clear window so you can monitor the oil levels and also has a chain break feature for optimal safety during usage. This is backed by Black & Decker's 2 year limited warranty. 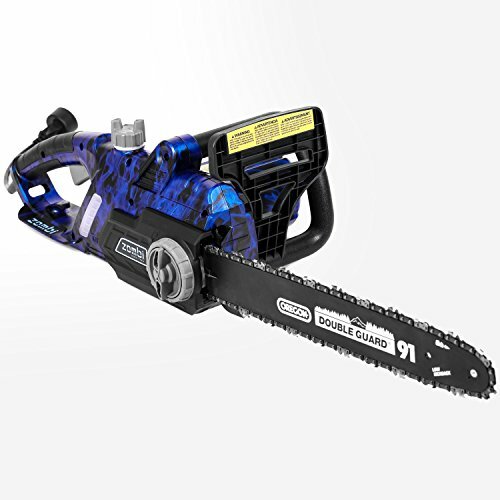 Starting cutting with the zombie's powerful 13 amp chainsaw. This easy to use, lightweight, & comfortable chainsaw is all you need for your lawn & cutting chores. No assembly required! 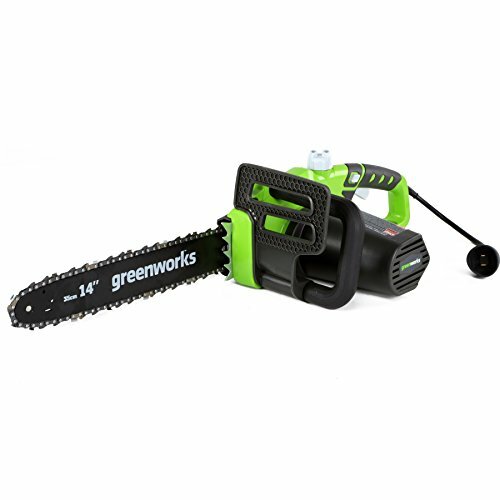 with this hassle free chainsaw, you will no longer have to mess with gas, all that is needed is an Extension cord & you are ready to cut. The tool-less chain tensioner is simple to use & no more digging around for tools to tighten the chain. This chainsaw features a front hand guard & a safety start button to prevent accidental starts. Product features: 120/60Hz 13 amp 16" Oregon bar & chain/ tool-less tensioner oil level window/ auto oiler double insulated cord comfortable rubber over molded handles 0.15m UL cord & plug no assembly required water transfer pain design. SAW WHAT YOU SEE – WITH THE ONE SAW THAT DOES DOUBLE DUTY! Tackle those hard-to-reach branches with ease. 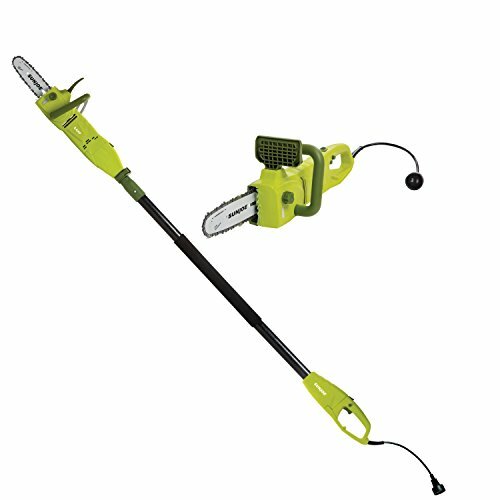 The Sun Joe SWJ806E 2-in-1 convertible electric pole chain + saw takes the danger and difficulty out of trimming your overgrown trees. 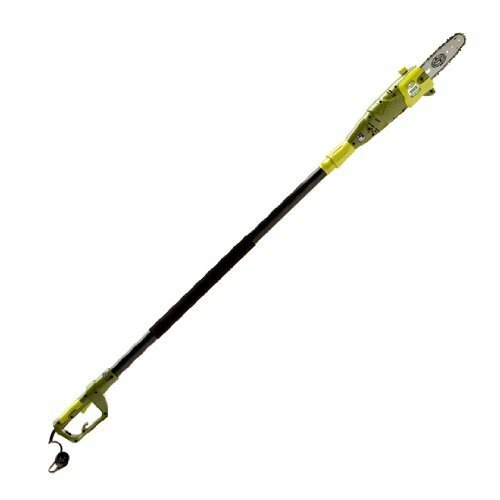 Stand safely on solid ground and simply adjust Sun Joe’s telescoping pole to gain up to 15 feet of overhead reach. Later, when the limbs are down and there’s wood to be cut, Sun Joe quickly converts to a hand-held chainsaw to make light work of loads of logs. Powered by a robust 7.5-amp motor, the SWJ806E can handle the most stubborn tree limbs up to 7.5-inches thick. It features a durable, 8-inch Oregon bar and chain with an auto-oiler to keep the bar and chain fully lubricated during use. Unlike gas-powered tools, Sun Joe is powered electrically, so you’ll power up reliably every time with the push of a button, without having to deal with smoke, fumes, spark plugs or costly tune-ups. Plus the SWJ806E comes equipped with a built-in safety switch to prevent accidental starting. 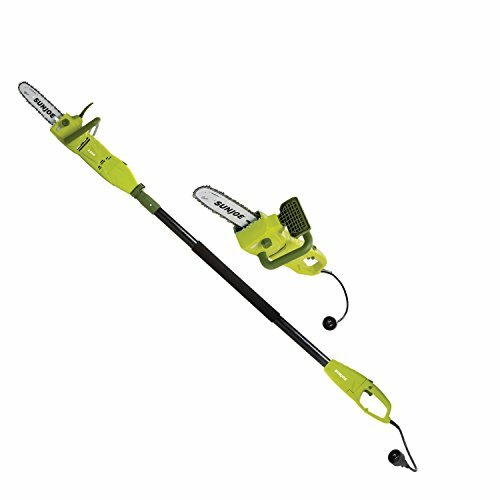 The Sun Joe SWJ806E convertible electric pole chain + saw carries a full two-year warranty. There may be better electric chainsaws out there, but this makita was the best choice for me. 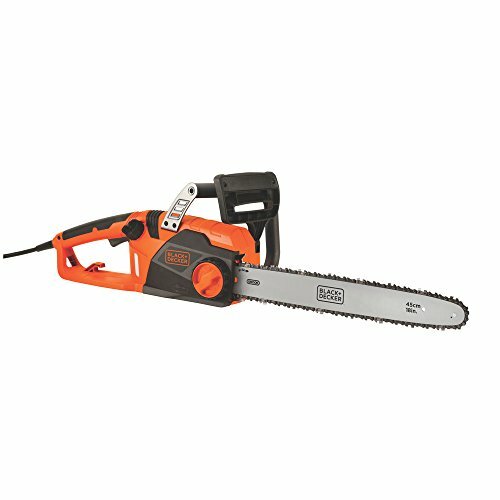 Compare prices on Chain Saw Electric at ShoppinGent.com – use promo codes and coupons for best offers and deals. Start smart buying with ShoppinGent.com right now and choose your golden price on every purchase.